At Templeton, we’ve repeatedly championed our value-driven philosophy by frequently buying at times others are most pessimistic. This is not easy to do, even for seasoned market veterans. 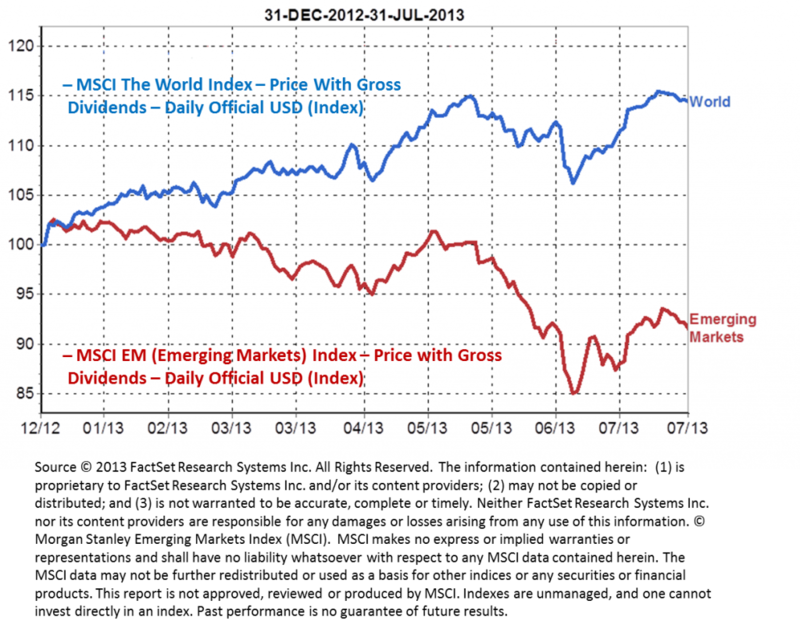 During the past few months, emerging markets have been subject to such pessimism. These periods of short-term volatility are certainly not new to us, and don’t change our long-term conviction of the potential emerging markets hold. We feel recent declines were overdone and based largely on irrational investor panic, and have viewed the recent pullback as an opportune time to search for bargains for our portfolios. We find valuations in many emerging and frontier stocks particularly attractive right now. No doubt, emerging markets have been beaten up a bit this year. In the second quarter, the MSCI Emerging Markets Index lost 8.0% in US Dollar terms1, and emerging markets recorded outflows of US$33 billion during the quarter; June alone accounted for US$22 billion of the flows2.This offset the US$32 billion in net inflows from the first quarter of 2013, resulting in a net outflow of about US$1 billion for the first half of the year. What happened? Indications in mid-May from US Federal Reserve Chairman Ben Bernanke about a moderation in the central bank’s asset purchase program caused fixed income investors who had invested in offshore bonds, particularly in emerging markets bonds, to view the high yields they were receiving in those bonds as less attractive if US interest rates were to rise. In addition, signals from the People’s Bank of China that it would not intervene in the market after a sharp spike in a key interbank lending rate in June raised concerns about the stability of the banking sector there, and further heightened investor concerns that global liquidity could dry up. A sharp, across-the-board sell-off hit emerging market debt, currencies and equities during the second quarter. Those particular emerging market countries with high current account deficits, large foreign holdings of local bonds and exposure to China were among the worst affected. Turkey, Egypt and Brazil were particularly hard hit; their respective equity markets ended the quarter with declines. In addition, periods of social unrest in these countries also heightened investor anxiety. However, as you can see in the two charts below, despite the short term outperformance of world markets, over the longer term emerging markets have outperformed, and we expect this trend to continue for reasons outlined further here. Like all markets, emerging markets can at times be volatile and dominated by excessive flows and sudden sentiment shifts. Many are now dubbing the BRIC countries (a handy acronym for the grouping of Brazil, Russia, India and China) down and out, but we think there has been too much negativity there. I believe that the strong prospects for growth in many emerging markets are not currently recognized in equity valuations, which generally lag those of developed world markets. 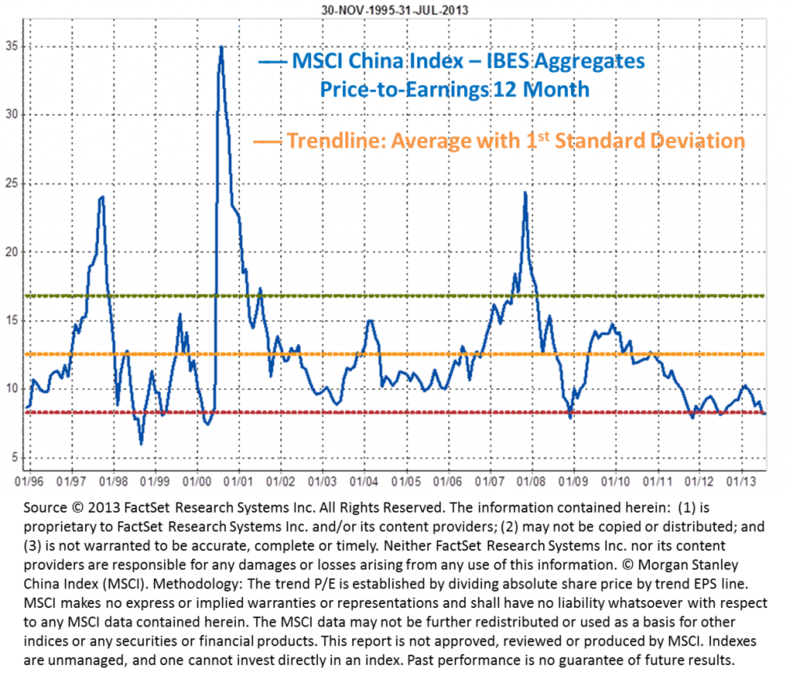 We are finding attractive valuations not only in the BRICs but particularly so in the frontier markets (a subset of emerging markets), which in some cases have single-digit price-earnings (P/E) ratios and even lower price-to-book ratios. (See charts below for emerging markets overall, and specifically, China.) But no matter what major market indexes may show, as bottom-up stock pickers, we hone in on individual opportunities, and currently see many good companies that were unjustifiably swept along in the tide of negative sentiment. Periods of Pessimism = Best Times to Buy? It is always necessary to take hits from time to time as we maintain our long-term focus. A case-in-point is Thailand, a country with its fair share of turbulent periods. In the mid-90s, while the country was in the midst of a massive financial crisis, I eagerly hopped on a plane to Bangkok, in search of opportunities while many investors gave up on the country. Why did I feel so positive? I certainly knew that in the short-term, Thailand was in trouble. But we did our homework, and felt that in three, four, or five years’ time, the Thai people would bounce back. And they did. Of course, it wasn’t all smooth sailing. After recovering from that crisis period, further setbacks came in 2004, when a tsunami struck the country, and in 2011, when severe flooding hit. But Thailand has been adept at battling back from adversity time and time again, and in 2012, its equity market posted one of the best performances in Asia (and even the world), with the benchmark Stock Exchange of Thailand (SET) Index returning more than 35%3. You can see the merit of buying during these downturns and holding on for the potential recovery. Today, we believe there is great potential for Thailand, which we feel could be on the cusp of a growth spurt, with, of course, corrections along the way. I would not classify this recent bout of emerging market volatility a crisis of confidence as some would, but it marks a good time to again reiterate the value of a long-term perspective and emphasize that we base our analysis and projections not on this year or even next year, but generally five years out in time. Being contrarian or value-driven doesn’t mean we will necessarily buy anything we can get our hands on during a market downturn. During times of extreme stress, liquidity is important. If I have a choice between a small, illiquid stock and a large liquid one, naturally I would pick the latter. When buying stocks during a bust period, it’s important that you don’t buy corpses which have fallen in price but have unhealthy fundamentals (otherwise known as “value traps”), but rather, find patients with good recovery prospects that appear undervalued. There are a few characteristics we’ve seen in companies that often prove fatal and that we seek to avoid, including excessively high levels of debt and management who can’t cope with a difficult environment. In the case of Thailand’s big financial crisis, it was extremely important to be a good stock-picker and do your homework. By the end of 1997, out of the 480 companies trading on Thailand’s stock exchange, about 40 companies had gone belly up, and a near equal number saw trading suspended. 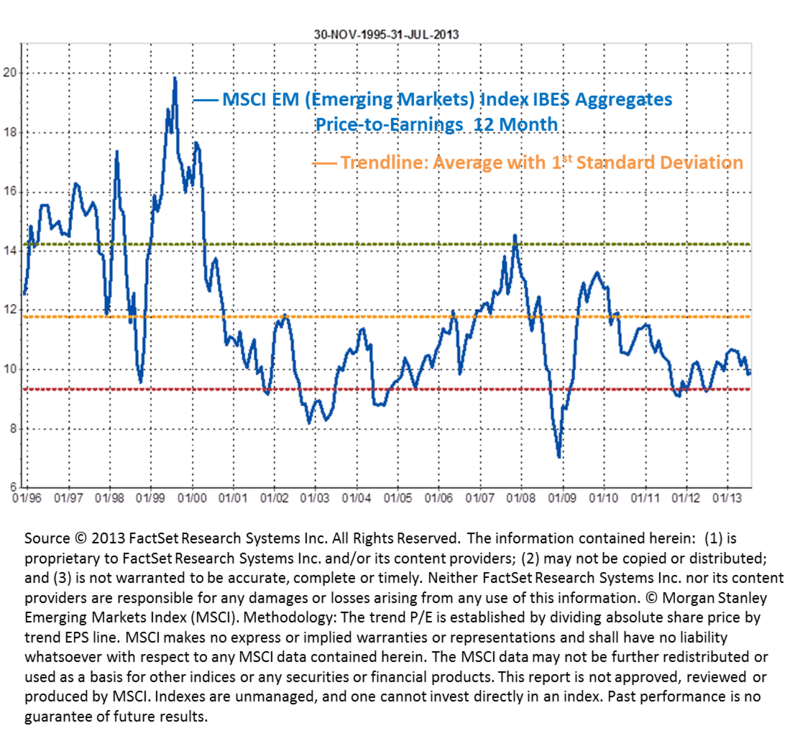 I believe emerging markets in general have three attractive characteristics, which haven’t changed from what I see. First, their growth rates have generally remained well in excess of those for developed markets. Overall, emerging markets are forecast to grow about five times faster than developed markets in 2013, with the IMF forecasting average GDP growth of 5.0% for emerging markets, compared to just 1.2% for developed markets4. Second, emerging markets generally have large and growing foreign exchange reserves, which are far greater than that of developed markets. Moreover, unlike developed markets, many emerging and frontier markets still appear to have ample room for fiscal and monetary stimulus. Although weak growth in developed markets could be transmitted to emerging markets, notably through declines in world trade, this influence could continue to be offset in emerging markets by higher investment spending and increased domestic demand. Third, the debt level of many emerging markets in relation to their GDP is generally much lower than that of many developed markets. Additionally, all this fear and concern about the US central bank starting to “taper” its asset buying program does not necessarily mean it is going to start tightening rates anytime soon or that the money supply will suddenly dry up. We must remember that the various QE programs have been cumulative so that the liquidity pumped into the system has piled up and will not disappear overnight. It is only recently that banks have begun to grow their loans; previously they were using the liquidity supplied by the Fed to strengthen their balance sheets and were holding US Treasuries. In addition, even if the Fed starts to pull back as the US economy improves, other central banks are still generating liquidity, which we feel could support investor flows into emerging markets. Japan has been embarking on a massive easing program, which is greater as a percentage of their GDP than the US’ program. While we worry about the long-term implications of inflation, if it can be avoided or offset by greater productivity gains, it could be a game-changer for many economies. 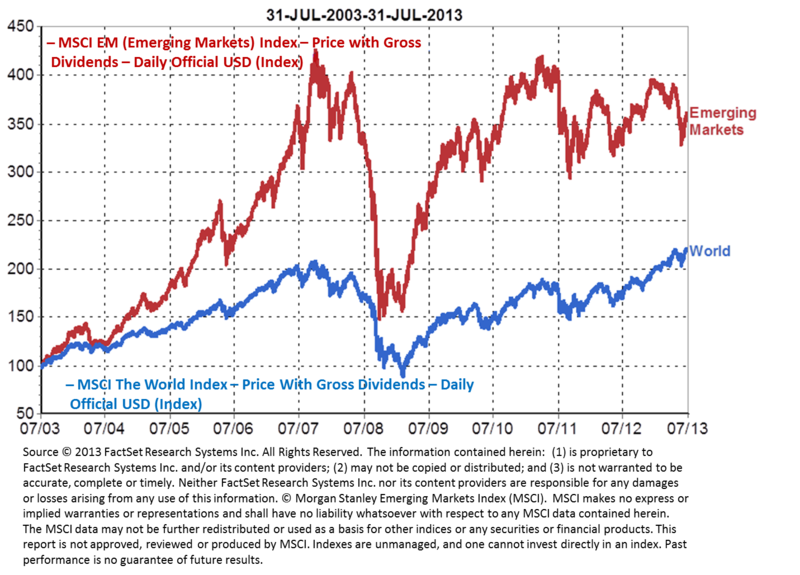 Overall, I believe emerging markets will likely continue to offer good long-term prospects for patient investors. There are always risks, and unexpected shocks could occur. But I still believe in the comeback story. 1. Source: © Morgan Stanley Capital Index (MSCI). MSCI makes no express or implied warranties or representations and shall have no liability whatsoever with respect to any MSCI data contained herein. The MSCI data may not be further redistributed or used as a basis for other indices or any securities or financial products. This report is not approved, reviewed or produced by MSCI. Indexes are unmanaged and one cannot invest in an index. Past performance is no guarantee of future results. 3. Source: FactSet. US dollar terms. The SET Index is a capitalization-weighted index of stocks traded on the Stock Exchange of Thailand. Past performance is no guarantee of future results. An index is unmanaged and one cannot directly invest in an index. 4. Source: IMF World Economic Outlook, July Copyright © 2013 International Monetary Fund. All Rights Reserved.